We utilize our own highly specialized process of cleaning, repairing, toning, and top coating hotel furniture in a completely environmentally friendly manner while ensuring our finishes are held to the harshest commercial standards. Jensen & Son's unique in-room repairs and furniture finishing features fourth generation GREENGUARD™ AIR QUALITY CERTIFIED waterborne lacquer products and mobile vapor capture filter units on-site, so that completed rooms can generally be occupied in as little as three hours with no mess, lingering residue or disruption to your normal daily operations. Projects that are typically serviced professionally on a annual basis or new case-goods with installation damage. Inspect all items for mechanical and structural deficiencies. Professionally fill all nicks and chips with color matched pigments, applicators, hard and soft wax epoxy fillers to create fine well maintained appearance. Repair color faded and worn areas with color-matched toners. Lubricate and adjust on all mechanical hinges & guides. The most popular service level that case-goods have gone 3-7 years between professional servicing. This service level colors and fills all chips and damage with hard wax and epoxy fillers finish coated with catalyzed lacquer clear coat for a strong protective finish over the repairs and then hand apply a coat of protective wax over all exposed sides, which not only enhances its overall look but helps protect it against further damage and long term exposure. Inspect all items for mechanical defects and repair as needed for intended use. Inspect and tighten all applicable joinery. Clean all finished surfaces as needed. Repair pressure dents, gouges and scratched surfaces. Repair color faded and worn areas with color-matched pigments & stain toner. Hand-apply protective finish of applicable sheen over repairs to ensure durability. Restore all existing surfaces using applicable surface restorer or wax compounds. Lubricate/wax and perform maintenance on all mechanical hinges & guides. Adjust doors and drawers as needed. Return furniture to as high level of visual appeal as possible using methods described. Case-goods that typically older than 8 years showing signs of severe wear and tear or failing finish coat. Inspect all items for mechanical defects and repair as needed for suited use. Prepare and tape off work area/room with great care to protect contents. Install applicable ventilation and mist collection equipment. Clean all finished surfaces with TSP cleaner and de-waxer. Sand scuff coat furniture with 180-220 grit abrasive compounds. Apply de-glosser to prepare existing finish to accept new top coat. Fill all nicks & chips and gouges with epoxy based color matched fillers. Repair faded and worn areas with color-matched pigments & stain toners. Spray apply optional coat of color tinted base coat to specified hue. Apply a minimum of two coats of GREENGUARD™ certified Low VOC catalyzed fourth generation water borne lacquer finish. Replace or polish handles and pulls as requested. Return furniture and room to as high level of visual appeal as possible described methods. Cost Effective - Proper refinishing, repair, and professional touch-up can successfully double the intended life cycle of your case-goods postponing a full renovation for years, thus saving tens of thousands of dollars. Results- Your guestrooms look fresh and new. Design- Talk to our professionals about changing the appearance of your furniture to accommodate new trends in the industry. Process - We fully customize our process to accommodate your specific needs and requirements to provide you with the best and most cost effective path to achieve the your intended result. Materials - We use the finest products available to the industry. We provide fantastic results using non-toxic, non-volatile, non-flammable, and odorless products whenever possible. Well equipped- We understand what it will takes to complete your job and we will equip accordingly with minimal interference to your operations . Professional conduct- Our crews are polite, experienced, clean and uniformed. We understand our clients for need for professionalism and image and seamlessly integrate within your environment. Honesty- Our experience has taught us what is possible and what must be done in order to complete a project. We always make commitments we know we can honor. Pacing - We take the time to discuss, thoroughly understand the scope and all expectations of a project before we make our commitments. Our decades of Hotel furniture experience and project management allows us to efficiently recognize any variables in advance, allowing us to provide precise, accurate and honest completion dates. Jensen & Son provides on or off-site furniture restoration in guest rooms, public space, Ballrooms, resturants etc. This is a cost effective alternative to furniture replacement. 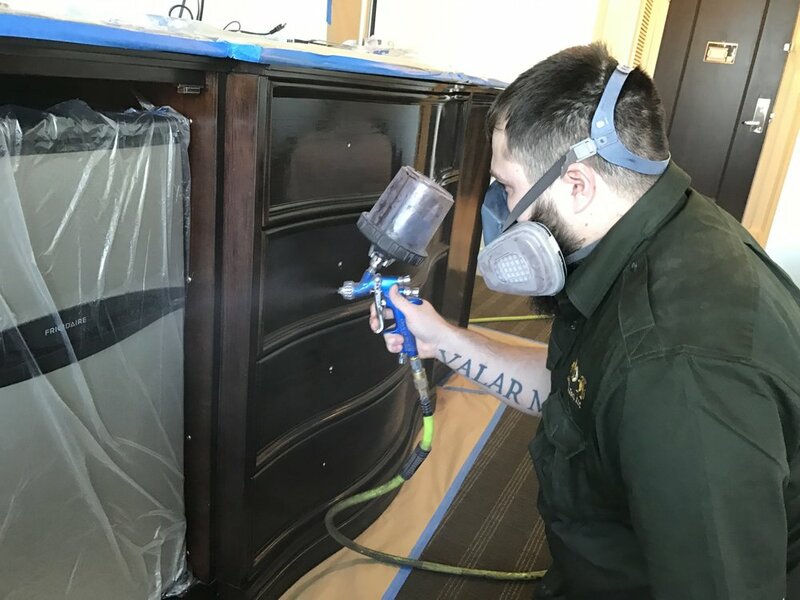 Our restoration level service elevates the appearance of your furniture to brand standard requirements, improving the overall guest experience to the highest levels possible.